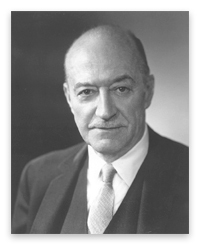 Henry Hazlitt was a libertarian philosopher, an economist, and a journalist for various publications including The Wall Street Journal and The New York Times, and Newsweek. He was the founding vice-president of the Foundation for Economic Education and an early editor of The Freeman, an important libertarian magazine. In 1946 Hazlitt wrote Economics in One Lesson, his seminal text on free market economics, which Ayn Rand called a "magnificent job of theoretical exposition." Hazlitt is credited with bringing his ideas and those of the so-called Austrian School to the American economics scene; his work has influenced the likes of economist Ludwig von Mises, novelist Ayn Rand, and three-time presidential candidate Ron Paul.